The HERO7 Silver records 1440p resolution at 4:3 aspect ratio and this image can be cropped in the companion GoPro app to provide you with a 1080p60 / 1080p30 16:9 image. HERO7 Silver is rated 3.9 out of 5 by 38. Rated 4 out of 5 by Nikhil from Great Gadget with scope of improvement Let me start with some of the positives, 1. The device is a great pocket device and the ease of use is wonderful 2. Connects with your phone app and just has wonderful functionality 3. Clarity is good and the stabilization works wonderfully Some scope of improvement 1. Battery life is bad. I would rather have a little bigger gopro and better battery life. 2. Once you have the device in its holder it gets difficult to click tiny buttons. Specially when you are doing outdoor activity 3. The battery is replaceable but they do not provide an external charger with the device which I find horrible on part of the company. Its not the money but lack of understanding of its customers. Rated 5 out of 5 by Tim from Outstanding Image Quality The GoPro Hero 7 Black piqued my curiosity both personally and professionally. The image quality is outstanding even before any color grading. While still not the ideal device for low light situations the camera performs very well just about anywhere else. The digital hyper smooth functionality is excellent and does reduce the need for a gimbal but I hesitate to call it a “gimbal killer”. The only complaint is the location of the SD card. It is difficult to take it out with the battery in place. Other than that, I would highly recommend this device to the novice and the polished content creator alike. Rated 5 out of 5 by Balmore from Definitely Not Bad. I’m diggin it. It’s not perfect. It glitches every now and then. But if you’re smart and learn to anticipate you can get around that. Definitely get extra batteries. It’s a small camera don’t expect a whole days worth out of one battery. Quality is great. About as good as you can get out of a small quick camera. You gotta realize that this camera is for quick, thoughtless action capture. The best you can get in the quickest time. It delivers. But you gotta know how to use it. Get familiar with it then you’ll definitely go pro. I use canon 5Diii, 6D, and 7D. The GoPro 7 black is the camera I use every day. Rated 4 out of 5 by Doug from Some good...Some to be watched First and foremost - I use the heck out of GoPro's with gimbals and have for years. I have been shooting with 7 Black for about a week so it is still early but I can offer some immediate thoughts. Some issues I am unsure of as I am going to have to step through my settings and do extensive testing...Model 6 did not require much testing. The image stabilization is an improvement when the camera is NOT on a gimbal. I use an EVO gimbal and I see hard bumps at the end of pans and other side to side movement (while on the gimbal) ...as if the internal stabilization is over compensating. In lower light, flesh/faces (up close) take on a cartoony grain similar to a cartooner digital filter look. Lower light is handled better in 7 than any previous model. I will update my thoughts in another week or two. I shoot hours every week with this rig and I feel I must be careful or my free and easy footage my be damaged by the digital bumps I am currently getting. Rated 4 out of 5 by Bill from Great Isn't Perfect Been using this a few weeks...great improvements over my Hero3 Black. The stabilization is insanely good! Video picture quality can be stunning, but Moire Effect on brick is very pronounced, leaving some shots unusable. Voice activation is spotty. App is great. Overall, a very good value as long as you adjust to a few limitations of the camera class. Rated 4 out of 5 by Michael from New buyer....4/3/2019...guess that I AM -now- an action cam idiot... Camera build good. Like the size. Will live with the battery life - not shooting a motion picture. Trying to find the correct camera control via my iPad not working. Battery door a pain - often won’t re-seat. You have to really poke the SD card in for it to hold. Set-up a bit strange - especially trying to pair with my iPad for software update - not sure if it took. My camera kept defaulting to video on start up - though I had set it for stills. Wish that it had more color control. Wish that I knew what shutter speed I was shooting at. The instruction leaflet is about all that you get. Buy the lanyard case - easier way to carry it. A brave new world for a former broadcast photog! Rated 5 out of 5 by Dario from Watch the settings before After turning it on I had some dificulties trying to update it via the app. Be sure to have a stable and strong internet connection to pass this stage quickly. (You may require to turn the bluetooth on and restart the app after doing so) If you cant pair the camera with the app after the update, try changing the frequency from 5.0 to 2.4Ghz. After this little inconveniences just go record something. The camera is amazing and the menu very intuitive. Stabilization awesome! I have a 3 hour recording. Can a high current USB charger run it for 3 hours? What is the output resolution and color bit depth from the hdmi port? This camera will output 1080p at 8-Bit through HDMI. With earlier GoPros, to do an extended shoot you could attach an external btry like an Anker, but to make that work you had to take out the GoPro's own battery. The Hero7 Silver has a BUILT-IN battery. Does that mean that you can't do an extended shoot with it by using an external bat? Hero 7: In 4K mode can be used different FOV settings (wide, medium &amp; narrow), or only wide? Will the Hero7 take the same battery as the 6? Can you use the camera while charging via USB? I do that all the time on my Hero 5. I dont think that feature would be removed. 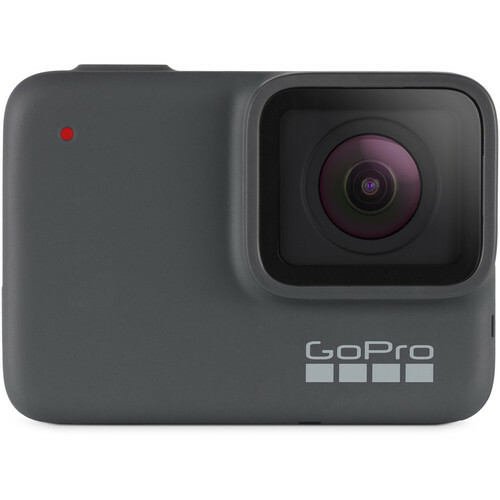 What is the color bit depth of this GoPro? 4:2:0? Excerpt from the GoPro HERO7's MENU: &quot; PREFERENCE/ GENERAL/ 'Video Compression'/: - HEVC HEVC reduces file sizes to maximize storage. Be sure your other devices are HEVC compatible. - H.264 + HEVC Uses H.264 to maximize compatibility with older devices and HEVC for advanced settings. &quot; === There 2 choices for Video Compressions, each with explanation as enclosed above. 1. HEVC First choice is the new HEVC (ONLY. 2. HEVC + H.264 Second choice is a PAIR: the new HEVC, and it is accompanied with the old H.264. - BY DEFAULT. It seems to me that GoPro HERO7 provides enough explanation in the MENU for its customers already. Hope this help.